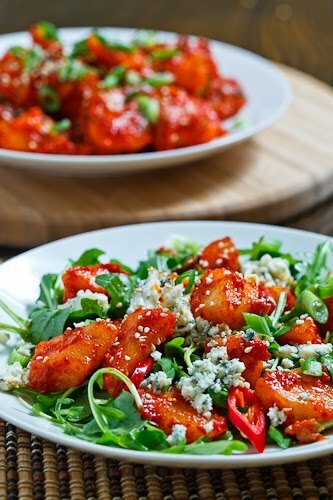 Sweet and spicy Korean pear kimchi served in a salad with creamy and tangy blue cheese. Now that I had my pear kimchi it was time to move on to the pear kimchi and blue cheese salad inspired by the Swish by Han . Sweet pear and tangy blue cheese is an amazing flavour combination that I never tire of and it works particularly well in the form of a pear and blue cheese salad so I was really enthusiastic about the idea of a pear kimchi and blue cheese salad! I kept the salad pretty simple, focusing on the pear kimchi and blue cheese that I added to some arugula tossed in an Asian style vinaigrette with a few garnishes. I have to say that the sweet and spicy pear kimchi and creamy and tangy blue cheese works really together in this salad and I was quickly going back for seconds! Toss the arugula, green onions and red chili pepper in the vinaigrette. Add the pear kimchi sprinkle on the blue cheese and sesame seeds. A simple and yet tasty vinaigrette with Asian flavours. All your meals look so gourmet and tasty! I keep bookmarking them to try and cook later, but realizing I really need my own kitchen (not borrowed boyfriend's kitchen or parents') to do them. But nicely done again! this is a very unique idea… and stunning photo too! I don't know how you come up with these things, Kevin, but I love you for it! you have an imagination that's for sure, i'm going to try this with peaches, i wonder if i will remember in august….. I have a crush on your food creativity.